This tour operator accepts travel agent bookings. The girl will call Floyd on the telephone. WELCOME TO THE SMALL TOUR OPERATORS OF THE TWIN TOWNS OF SANTA ELENA AND SAN IGNACIO IN WESTERN BELIZE. This web page was prepared by Ray Auxillou of Falconview Hacienda in Hillview/Santa Elena, Western Belize. 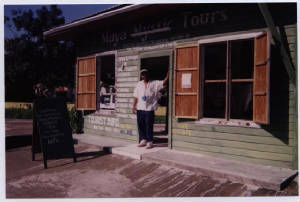 Prices can change without notice and the information was accurate as of mid January 2005, as given by tour operators at that time. There are FIVE Tour Operators in Western Belize twin towns straddling the Macal River as it flows out of the Belize Alps and the Macal River Gorge. 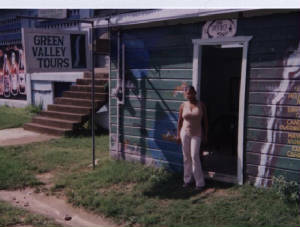 They are GREEN VALLEY TOURS found opposite the open air market in a small wooden building. Owned by Floyd Rojas and his wife. Floyd is an ex: Belize Defense Force soldier and loves the outdoors. He is organizing a Jungle Survival course, his specialty. His wife is a school teacher. Their operation offers the 20% commission for booking agents and lodges. They subcontract to jungle lodges and hotels in the rural areas that don't want to actually have the problem of doing expeditions and tours themselves. DAVIDS ADVENTURE TOURS are locate a hundred feet away from GREEN VALLEY TOURS across from the market. David does not give commissions and caters mainly to walk-in transients. MAYA WALK TOURS is in a big building across from the famous Eva's Restaurant. Their specialty is the Actun Timichil Muknal tour, but they do the ruins and other destinations as well. They offer no commissions, but will offer a discount on groups to local lodges and hotels. ANGEL TOURS doesn't seem to have an office? But they have a big sign board up with prices and are said to be booked out of Eva's Restaurant. See Bob! MAYA MYSTIC TOURS is a general tour operator, but specializes in canoing rivers and rapids This is run by Sandro Requena all year round, and has the equipment. They also offer 20% commissions to booking agents. They are found around the corner from Davids Adventures facing the gazebo band stand in the central parque and taxi and bus station. EVAS RESTAURANT does not actually do any tours of itself. But they allow small operators to function out of their restaurant and can usually fix the transient walk-in with a trip to ruins, at competitive prices in a hurry. Even if it is only by taxi. Bob knows a number of licensed tour operators who have no official office, but are perhaps taxi drivers most of the time. There are no commissions offered here, but price is negotiable. Xunantanich and Cahel Pech Mayan Ruins 1/2 day at $50 USA. Includes entrance fees. 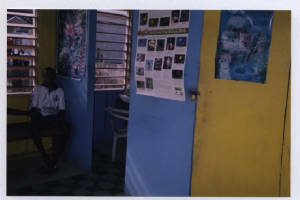 Inside view of office opposite open air market. Inner tube floating on the Macal River, or you rent the tube for $5 USA a day. A half day to the Mountain Pine Ridge is $30 USA but unlikely to be enough time. Humming Bird Highway Blue Hole swim at $35 USA and includes St. Hermans Cave. Neat trip! The tour operator Mr. Requena in doorway here! Maya Mystic Tours will book with agents and hotels to handle their trips. Run by Sandro Requena operates all year round and offers 20% to booking agents. This tour operator has six canoes, 15 tube and 6 kayaks holding two persons. Barton Creek tour 1/2 day at $40 USA includes the entrance fee. They insist on minimum of two people. No commissions, but they will give a discount on groups. 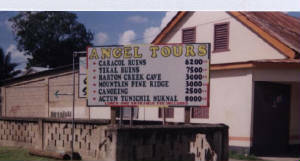 Angel Tours only has this sign board. This tour operator has no office but works out of Eva's Restaurant down the street. Can book multiple trips through this website for different tour operators, usually small guys with a regular day job. No advance payment, works mostly walk-ins to restaurant, pay as you arrive and on a first come- first served basis. No reservations necessary. He phones around, or sends a messenger to locate someone with a tour guide license. This is a FREE information website to foster the growth of tourism in Western Belize. Many interesting adventurous places have not been developed yet; due to distance, bad roads, or lack of finance. e.g. : The remote SECRET JUNGLE GOLD FIELDS of the Southern Belize Alps, or Maya Mountains. The gorgeous SIBUN GORGE, or the ROARING CREEK GORGE with a couple of waterfalls over a 1000 feet high, the BELIZE ALPS hiking potential and one day, a trail to Victoria Peak from the North approach, or the Caves Branch Gorge, or Mountain Biking Brunton Trail downhill from 3200 ft to 600 ft ending at the campground in De Silva Augustine Forestry village. The area is remote and people are on their own back out there. There is no rescue if you get in trouble. But it sure is rugged and beautiful pristine territory. Floyd of Green Valley Tours wants to organize regular jungle survival courses in these remote areas, where today only British and Local Defense soldiers go and take their jungle training, like he did once in younger years. There is fantastic potential for sailplanes, gliders, ultra lights, hang gliders and para-gliders on the standing waves doing ridge flying and cumulus thermals, on a sunny day in the remote pine clad Belize Alps; 75 miles away from the twin towns of Western Belize, over rugged dirt logging roads. of the Tour Operators out of the Twin towns of Western Belize, only two tour operators offer 20% commissions to booking agents. These are MAYA MYSTIC TOURS and the other is GREEN VALLEY TOURS. CLICK HERE to read more about Western Belize culture and area, with photos.